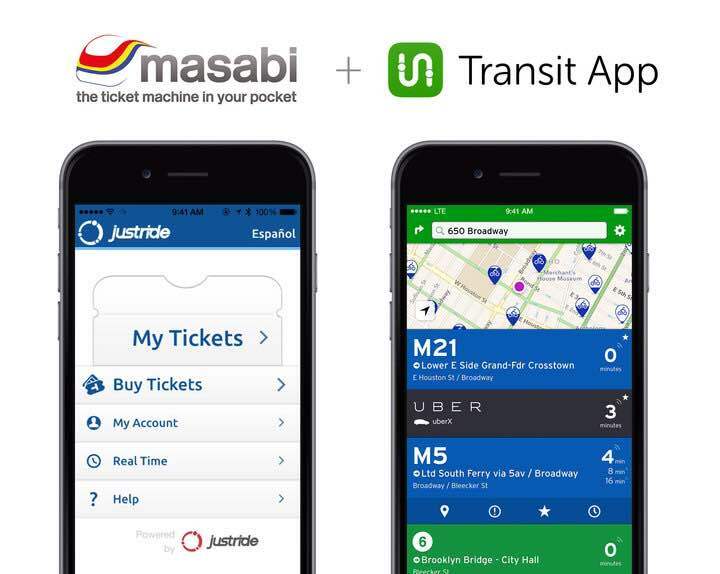 October 5th, 2015 – San Francisco: Masabi, the global leader in transit mobile ticketing and innovative fare collection, and Transit App, North America’s leading urban transport application, have today announced a partnership to simplify the transit experience through a mutual integration, providing a seamless link between real-time customer information, journey planning, and ticket purchase. Masabi’s award-winning Mobile Ticketing platform, JustRide, is a cloud-based, deployment-proven, end-to-end mobile ticketing and fare collection system in use in cities across the world. It comprises services for ticket purchase, display, and inspection, together with back-end infrastructure for secure payments, ticket management, customer service, reporting and real-time analytics. Transit App’s mobile application integrates sustainable urban transport systems in over 100 cities across North America and Europe. Designed for everyday travel, Transit App provides instant access to information about all nearby transport options, including real-time departures, a-to-b trip planning, and service disruptions. Recently, Transit App partnered with PBSC Urban Solutions, a world leader in bike-sharing systems, to enable mobile bike share payment and unlocking - a first in North America. Masabi, is the leader in transit mobile ticketing and payments, delivering end-to-end fare payment systems that deliver significant cost savings while revolutionizing the customer experience. Masabi’s JustRide system signals the end of ticket lines, lost tickets, and fumbling for cash by allowing passengers to quickly and securely buy and display tickets on their mobile phones. Masabi enables transit agencies to move away from traditional, capital-intensive “locked-in” systems, such as smartcards and costly customized ticket machines, to a flexible, open system that transforms passengers’ travel experience today and offers a roadmap to NFC and open payments in the future. Masabi is backed by Fontinalis Partners, m8 Capital and MMC Ventures. The company’s scalable cloud-based technology already processes transactions totaling more than $110 million per year, handles millions of connections per day, and is working with 22 global transit agencies and retail brands, including: Virgin Trains, First Group, Boston’s MBTA, San Diego MTS as well as recently winning the contract to deliver mobile ticketing for New York’s MTA. Masabi has offices in New York, Boston, and London. Transit App solves the daily commute in more than 100 cities around the world. Right on launch, Transit App displays all nearby transport options and departure times in big text and bright colors. Users can plan trips, set reminders, and get notifications about disruptions. In addition to public transit, the application integrates all sustainable transport modes, including bike sharing, car sharing and Uber. Counting millions of active users in the US and Canada, Transit App has emerged as the leading urban transport app in North America. The company is based in Montreal, Quebec. You can visit www.transitapp.com for more information.